Learn the characteristic charges that ions have. Construct a proper formula for an ionic compound. Generate a proper name for an ionic compound. So far, we have discussed elements and compounds that are electrically neutral. They have the same number of electrons as protons, so the negative charges of the electrons is balanced by the positive charges of the protons. However, this is not always the case. Electrons can move from one atom to another; when they do, species with overall electric charges are formed. Such species are called ions. Species with overall positive charges are termed cations, while species with overall negative charges are called anions. Remember that ions are formed only when electrons move from one atom to another; a proton never moves from one atom to another. Compounds formed from positive and negative ions are called ionic compounds. Third, there are some exceptions to the previous point. A few elements, all metals, can form more than one possible charge. For example, iron atoms can form 2+ cations or 3+ cations. Cobalt is another element that can form more than one possible charged ion (2+ and 3+), while lead can form 2+ or 4+ cations. Unfortunately, there is little understanding which two charges a metal atom may take, so it is best to just memorize the possible charges a particular element can have. Note the convention for indicating an ion. The magnitude of the charge is listed as a right superscript next to the symbol of the element. If the charge is a single positive or negative one, the number 1 is not written; if the magnitude of the charge is greater than 1, then the number is written before the + or − sign. An element symbol without a charge written next to it is assumed to be the uncharged atom. Naming an ion is straightforward. For a cation, simply use the name of the element and add the word ion (or if you want to be more specific, add cation) after the element’s name. So Na+ is the sodium ion; Ca2+ is the calcium ion. If the element has more than one possible charge, the value of the charge comes after the element name and before the word ion. Thus, Fe2+ is the iron two ion, while Fe3+ is the iron three ion. In print, we use roman numerals in parentheses to represent the charge on the ion, so these two iron ions would be represented as the iron(II) cation and the iron(III) cation, respectively. For a monatomic anion, use the stem of the element name and append the suffix -ide to it, and then add ion. This is similar to how we named molecular compounds. Thus, Cl− is the chloride ion, and N3− is the nitride ion. This species has a 2− charge on it, so it is an anion. Anions are named using the stem of the element name with the suffix -ide added. This is the oxide anion. Because this species has no charge, it is an atom in its elemental form. This is cobalt. In this case, there is a 2+ charge on the atom, so it is a cation. We note from Table 3.6 “Monatomic Ions of Various Charges” that cobalt cations can have two possible charges, so the name of the ion must specify which charge the ion has. This is the cobalt(II) cation. Chemical formulas for ionic compounds are called ionic formulas. A proper ionic formula has a cation and an anion in it; an ionic compound is never formed between two cations only or two anions only. The key to writing proper ionic formulas is simple: the total positive charge must balance the total negative charge. Because the charges on the ions are characteristic, sometimes we have to have more than one of a cation or an anion to balance the overall positive and negative charges. It is conventional to use the lowest ratio of ions that are needed to balance the charges. For example, consider the ionic compound between Na+ and Cl−. Each ion has a single charge, one positive and one negative, so we need only one ion of each to balance the overall charge. When writing the ionic formula, we follow two additional conventions: (1) write the formula for the cation first and the formula for the anion next, but (2) do not write the charges on the ions. Thus, for the compound between Na+ and Cl−, we have the ionic formula NaCl (Figure 3.5 “NaCl = Table Salt”). The formula Na2Cl2 also has balanced charges, but the convention is to use the lowest ratio of ions, which would be one of each. (Remember from our conventions for writing formulas that we don’t write a 1 subscript if there is only one atom of a particular element present.) For the ionic compound between magnesium cations (Mg2+) and oxide anions (O2−), again we need only one of each ion to balance the charges. By convention, the formula is MgO. The ionic compound NaCl is very common. Source: “Kosher Salt” by stlbites.com is licensed under the Creative Commons Attribution-NoDerivs 2.0 Generic. For the ionic compound between Mg2+ ions and Cl− ions, we now consider the fact that the charges have different magnitudes, 2+ on the magnesium ion and 1− on the chloride ion. To balance the charges with the lowest number of ions possible, we need to have two chloride ions to balance the charge on the one magnesium ion. Rather than write the formula MgClCl, we combine the two chloride ions and write it with a 2 subscript: MgCl2. What is the formula MgCl2 telling us? There are two chloride ions in the formula. Although chlorine as an element is a diatomic molecule, Cl2, elemental chlorine is not part of this ionic compound. The chlorine is in the form of a negatively charged ion, not the neutral element. The 2 subscript is in the ionic formula because we need two Cl− ions to balance the charge on one Mg2+ ion. Write the proper ionic formula for each of the two given ions. We need two Cl− ions to balance the charge on one Ca2+ ion, so the proper ionic formula is CaCl2. We need three F− ions to balance the charge on the Al3+ ion, so the proper ionic formula is AlF3. With Al3+ and O2−, note that neither charge is a perfect multiple of the other. This means we have to go to a least common multiple, which in this case will be six. To get a total of 6+, we need two Al3+ ions; to get 6−, we need three O2− ions. Hence the proper ionic formula is Al2O3. Write the proper ionic formulas for each of the two given ions. Naming ionic compounds is simple: combine the name of the cation and the name of the anion, in both cases omitting the word ion. Do not use numerical prefixes if there is more than one ion necessary to balance the charges. NaCl is sodium chloride, a combination of the name of the cation (sodium) and the anion (chloride). MgO is magnesium oxide. MgCl2 is magnesium chloride—not magnesium dichloride. In naming ionic compounds whose cations can have more than one possible charge, we must also include the charge, in parentheses and in roman numerals, as part of the name. Hence FeS is iron(II) sulfide, while Fe2S3 is iron(III) sulfide. Again, no numerical prefixes appear in the name. The number of ions in the formula is dictated by the need to balance the positive and negative charges. Using the names of the ions, this ionic compound is named calcium chloride. It is not calcium(II) chloride because calcium forms only one cation when it forms an ion, and it has a characteristic charge of 2+. The name of this ionic compound is aluminum fluoride. We know that cobalt can have more than one possible charge; we just need to determine what it is. Oxide always has a 2− charge, so with three oxide ions, we have a total negative charge of 6−. This means that the two cobalt ions have to contribute 6+, which for two cobalt ions means that each one is 3+. Therefore, the proper name for this ionic compound is cobalt(III) oxide. How do you know whether a formula—and by extension, a name—is for a molecular compound or for an ionic compound? Molecular compounds form between nonmetals and nonmetals, while ionic compounds form between metals and nonmetals. The periodic table (Figure 3.2 “A Simple Periodic Table”) can be used to determine which elements are metals and nonmetals. There also exists a group of ions that contain more than one atom. These are called polyatomic ions. Table 3.7 “Common Polyatomic Ions” lists the formulas, charges, and names of some common polyatomic ions. Only one of them, the ammonium ion, is a cation; the rest are anions. Most of them also contain oxygen atoms, so sometimes they are referred to as oxyanions. Some of them, such as nitrate and nitrite, and sulfate and sulfite, have very similar formulas and names, so care must be taken to get the formulas and names correct. Note that the -ite polyatomic ion has one less oxygen atom in its formula than the -ate ion but with the same ionic charge. The naming of ionic compounds that contain polyatomic ions follows the same rules as the naming for other ionic compounds: simply combine the name of the cation and the name of the anion. Do not use numerical prefixes in the name if there is more than one polyatomic ion; the only exception to this is if the name of the ion itself contains a numerical prefix, such as dichromate or triiodide. Writing the formulas of ionic compounds has one important difference. If more than one polyatomic ion is needed to balance the overall charge in the formula, enclose the formula of the polyatomic ion in parentheses and write the proper numerical subscript to the right and outside the parentheses. Thus, the formula between calcium ions, Ca2+, and nitrate ions, NO3−, is properly written Ca(NO3)2, not CaNO32 or CaN2O6. Use parentheses where required. The name of this ionic compound is simply calcium nitrate. Write the proper formula and give the proper name for each ionic compound formed between the two listed ions. Because the ammonium ion has a 1+ charge and the sulfide ion has a 2− charge, we need two ammonium ions to balance the charge on a single sulfide ion. Enclosing the formula for the ammonium ion in parentheses, we have (NH4)2S. The compound’s name is ammonium sulfide. Because the ions have the same magnitude of charge, we need only one of each to balance the charges. The formula is AlPO4, and the name of the compound is aluminum phosphate. Neither charge is an exact multiple of the other, so we have to go to the least common multiple of 6. To get 6+, we need three iron(II) ions, and to get 6−, we need two phosphate ions. The proper formula is Fe3(PO4)2, and the compound’s name is iron(II) phosphate. The element sodium, at least in its ionic form as Na+, is a necessary nutrient for humans to live. In fact, the human body is approximately 0.15% sodium, with the average person having one-twentieth to one-tenth of a kilogram in their body at any given time, mostly in fluids outside cells and in other bodily fluids. Sodium is also present in our diet. 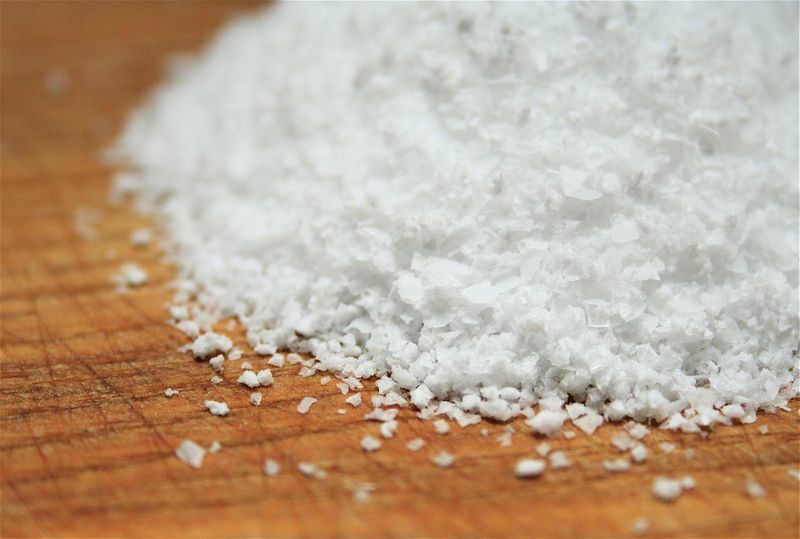 The common table salt we use on our foods is an ionic sodium compound. Many processed foods also contain significant amounts of sodium added to them as a variety of ionic compounds. Why are sodium compounds used so much? Usually sodium compounds are inexpensive, but, more importantly, most ionic sodium compounds dissolve easily. This allows processed food manufacturers to add sodium-containing substances to food mixtures and know that the compound will dissolve and distribute evenly throughout the food. Simple ionic compounds such as sodium nitrite (NaNO2) are added to cured meats, such as bacon and deli-style meats, while a compound called sodium benzoate is added to many packaged foods as a preservative. Table 3.8 “Some Sodium Compounds Added to Food” is a partial list of some sodium additives used in food. Some of them you may recognize after reading this chapter. Others you may not recognize, but they are all ionic sodium compounds with some negatively charged ion also present. The use of so many sodium compounds in prepared and processed foods has alarmed some physicians and nutritionists. They argue that the average person consumes too much sodium from his or her diet. The average person needs only about 500 mg of sodium every day; most people consume more than this—up to 10 times as much. Some studies have implicated increased sodium intake with high blood pressure; newer studies suggest that the link is questionable. However, there has been a push to reduce the amount of sodium most people ingest every day: avoid processed and manufactured foods, read labels on packaged foods (which include an indication of the sodium content), don’t oversalt foods, and use other herbs and spices besides salt in cooking. Food labels include the amount of sodium per serving. This particular label shows that there are 75 mg of sodium in one serving of this particular food item. Ions form when atoms lose or gain electrons. Ionic compounds have positive ions and negative ions. Ionic formulas balance the total positive and negative charges. Ionic compounds have a simple system of naming. Groups of atoms can have an overall charge and make ionic compounds. Give the charge each atom takes when it forms an ion. If more than one charge is possible, list both. 4. Give the charge each atom takes when it forms an ion. If more than one charge is possible, list both. 5. Give the charge each atom takes when it forms an ion. If more than one charge is possible, list both. 6. Give the charge each atom takes when it forms an ion. If more than one charge is possible, list both. 7. Name the ions from Exercise 3. 8. Name the ions from Exercise 4. 9 Name the ions from Exercise 5. 10. Name the ions from Exercise 6. 11. Give the formula and name for each ionic compound formed between the two listed ions. 12. Give the formula and name for each ionic compound formed between the two listed ions. 13. Give the formula and name for each ionic compound formed between the two listed ions. 14. Give the formula and name for each ionic compound formed between the two listed ions. 15. Give the formula and name for each ionic compound formed between the two listed ions. 16. Give the formula and name for each ionic compound formed between the two listed ions. 17. Give the formula and name for each ionic compound formed between the two listed ions. 18. Give the formula and name for each ionic compound formed between the two listed ions. 19. Give the formula and name for each ionic compound formed between the two listed ions. 20. Give the formula and name for each ionic compound formed between the two listed ions. 21. What is the difference between SO3 and SO32−? 22. What is the difference between NO2 and NO2−? Cations form by losing electrons. SO3 is sulfur trioxide, while SO32− is the sulfite ion. Ions and Ionic Compounds by Jessie A. Key is licensed under a Creative Commons Attribution-NonCommercial-ShareAlike 4.0 International License, except where otherwise noted.